Last year I was in New Hampshire and met Peter MacDonald. 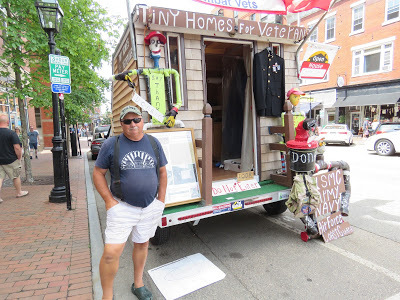 He was standing by one of his Tiny Homes for homeless veterans. Very sad to see how this story turned out for the veterans he wanted to help. LEE — Three homeless veterans were scheduled on Friday to vacate the Veteran Resort Chapel that has been the subject of litigation with the town. Peter Macdonald, the founder and president of the chapel, said he received verbal notice from the town that the residents had to be out by Friday, though he never received any formal eviction notice from the town. Macdonald said he adhered to Friday’s deadline because he didn’t want the chapel’s three residents, all homeless combat veterans, to be “caught off guard” when official notice eventually arrives. Macdonald said he notified the chapel residents about the evictions in late November. Of the three veterans, according to Macdonald, one is scheduled to move into an apartment in Hampton, one will live with a family member and another, whom Macdonald said suffers from post-traumatic stress syndrome, did not have a place to go as of Friday morning.